I can't believe it is a week since I was here last! My tiredness just seems to envelop me during the week and I am not fit for much more than collapsing on my bed with a book when I get home, so my time online and cooking is suffering. We are eating a lot of salads, pasta and baked potatoes, but nothing much that is blogworthy. I seem to be reverting to old favourites that are quick and easy to make. We are enjoying fresh pesto from the large pot of basil I have growing in the conservatory, but that is as about as complicated as it gets! However, yesterday, after a lie in, I had a notion to make some scones. And who do you go to for a good scone recipe? Why Delia of course! The original recipe is here, but I have changed it into cups for ease, so that next time I won't have to drag my scales out. In a large bowl, cube the butter, then sieve in the flour. Using your fingers, quickly rub the butter into the flour. Next stir in the sugar and salt. Using a knife, mix in the yogurt and milk, a little at a time, until the mix begins to bind together. If it is a little dry, add a small amount of milk. I have already included a little extra in my recipe to make it up to the ¾ cup, which worked out perfectly. If you just add it a little at a time, you will know when it is ready. Bring the dough together into a ball and roll out on a floured surface until it is about 2 cm deep. Use a cutter to cut the scones. Delia suggests not to twist the cutter, but to tap it sharply so it goes through the dough in one go . I have heard this before, apparently the dough rises better if it is not twisted, although is is easier said that done. Habit, I suppose! You should be able to make 8 scones out of the mixture. Place the scones onto a greased baking sheet, brush the tops with milk and bake for 12 - 15 minutes until risen and golden. Boy, what a treat these were, especially with that lovely homemade strawberry jam I bought at the farmer's market last week and the luxury of clotted cream. Needless to say they have been polished off today! They were lovely and light and I would use this recipe again. I liked the fact that it used greek yoghurt, which I always have in my fridge, instead of buttermilk, which I don't! Although I sometimes mix milk with lemon juice or vinegar as a substitute for buttermilk. Sometimes all you want to do is tuck into your old favourites and why not! Pure comfort food. Sounds like a perfect scone recipe. I haven't been cooking as much myself. Summer is such a treat and I cannot resist escaping outdoors for walks and trips to the backyard with books. Hi Lisa, you have to make the most of summer, well you do here anyway. It is fleeting! We have rain today, although it has been nice the last few days. Ooooh, strawberry and peach sounds delightful! I have a Strawberry and Ruby Grapefruit jam comig up in my baking group which I'm very excited about! I adore scones, just perfect this time of year! Clotted cream is one thing I couldn't live without during the summer months! 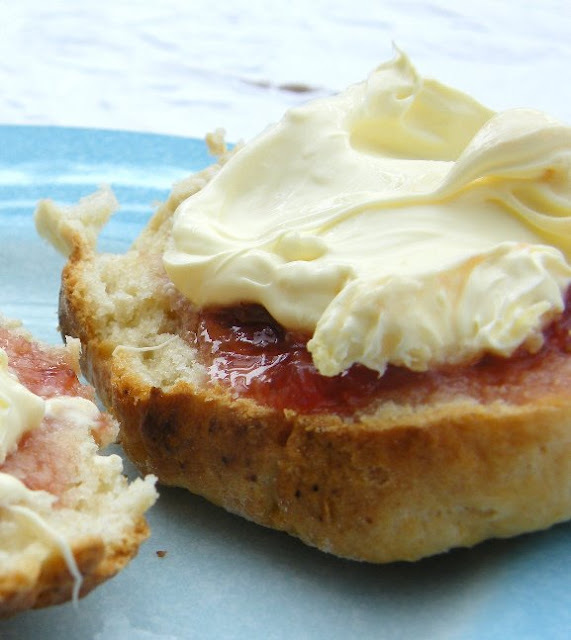 What is clotted cream? I've always wondered, it sounds delightful. That sounds like a great jam Katie, I will be watching out for your post. These scones looks so light and airy. I would love one of those for breakfast tomorrow. They are beautiful. the rhubarb orange sounds wonderful. I've never had clotted cream and had to look it up on the internet so I'd know what it was! Your scones sound like the perfect reason to get up from a lie-in. That's how it is sometimes. Just go with it and focus on being comfortable and at your own pace. This is like my dream breakfast. . . I've never had clotted cream, but have heard it is wonderful. And scones--yum, yum. This recipe uses a lot less butter than many others. And your scones have risen well enough. Very filling (depending on how many you eat!) and comforting. Ah, the memories of good English scones with clotted cream! Almost impossible to find in the states. What a mouthwatering photo! Oooo I would love a scone with mixed berry jam and vegan cream right now! I buy mixed berry jam, but I bet your home made one is amazing. I was thinking about making scones this week too! Great minds. :) These look gorgeous. Hope mine turn out even half as nice. Hi Maybelle's Mom, I do love rhubarb and it was a nice change to have something a bit different. Hi Andrea, scones with clotted cream and jam are famous down in Devon and Cornwell. In one the jam comes first and in the other it is the cream. It's a tradition down there. Thanks Cynthia, I am hoping to start getting back on track with a bit of energy. Yum yum - glad you've been enjoying scones too! I know what you mean about keeping things simple in the kitchen in the summer though. It's much nicer to be enjoying the long evenings than standing in front of a hot oven. Hi Johanna, I had not made any for ages, but they were so weel appreciated, I think I will be making them again soon! Delicious! I've never eaten clotted cream at home (probably a bad idea for me to have it at home because I love it a little too much). The clotted cream in that first photo is impossibly thick and divine. The scones look absolutely fabulous! But, it's that clotted cream I'm after. I find it so rarely around here...it's truly a delicacy! I looooove scones. I do make them quite often at home, though I use whipped cream instead of clotted cream, as I cannot find it here. Mmm. Maybe I should learn to make my own clotted cream? You fooled me. I thought you had topped your scones with clotted cream. Greek yogurt? Nice! I'll have to try that the next time I make scones. 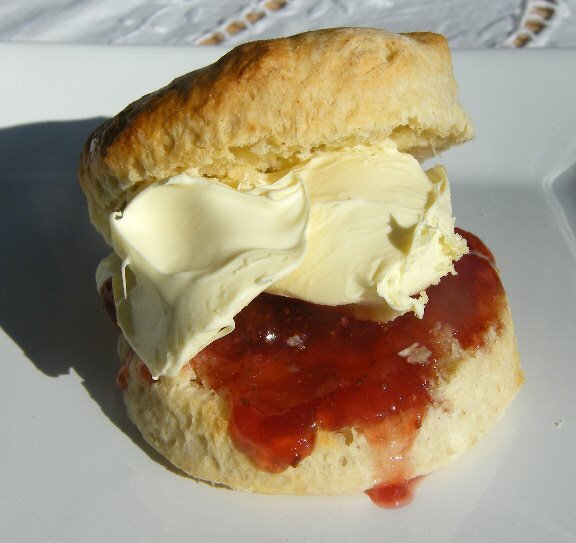 Let me know if you do give making your own clotted cream a go Pille. It is clotted cream Christine, yoghurt would be way too healthy, he he! Oh my goodness what a treat:-) I am still very sad with a very broken oven:-( Or else i would have made these & gobbled them up.